Dove’s Chocolate Chipotle Tri Tip. How good does a Dove’s Chocolate anything sound? Our friends Nate and Le Tonia are Dove Chocolatiers. A few months ago they sent us some of Dove’s Sweet’N’Spicy Cocoa Rub. I have used it on pork, lamb, duck, chicken and now a beef tri tip. It is not like anything you are thinking. It’s better. For example, the Mexicans have been cooking with chocolate in their foods for 200 years. Most folks don’t realize that a lot of good chili has a little cocoa in it. The cocoa is not meant to be over powering, but just to add another subtle layer to what you are cooking. And that is exactly what has happened here tonight. We had some “Crash Test Dummies” over for a 4th of July BBQ. (We did 3 BBQ’s that weekend.) We did up some MoinkBalls in teriyaki, Sweet Pepper Sliders, and a mountain of Buffalo wings along with 2 Tri Tips today. The Tri Tip was out of the ball park good. The Dove’s cocoa rub along with some chipotle chili powder and then a garlic pepper crust wasn’t like anything I have ever experienced! When the taste of beef layered with all the flavors of the grill is what you crave there is nothing like a good Tri-Tip Roast. It is a big tender piece of meat that is just packed with flavor. Awesome. We smoked the Tri Tip roast for about 45 minutes. Then, grilled them at 350 for about 15 minutes until the meat thermometer read 130 degrees. Keep in mind that your meat will continue cooking for another 10 degrees after you pull it off the grill. USDA says 130 degrees (55c) for rare. These guys were about 4 pounds each. I injected as much Country Bob’s All Purpose Sauce as they would hold. Then, made a wet rub with Dove’s Sweet N Spicy Cocoa Rub, chipotle chili powder, pepper, garlic, and Country Bob’s All Purpose Sauce to bind it all together. Sprinkled it on the meat rubbing it in, working my seasoning deep into the meat. Then, onto our Royall 3000 Wood Pellet Grill for 45 minutes of smoke before grilling it. Inject as much of the Country Bob’s as the meat will hold. You will be able see when it is full. Rub your spice mix into the meat and let it set awhile. Overnight is best, but not necessary. Open the lid and set the dial to “Smoke”, after about five minutes shut the lid. Give it about 10 minutes to heat up. Patti has lined the drip pan with foil for me, it makes for easier clean up. Place everything directly onto the grill and just let it hang out in the smoke and get happy for 45 minutes or so. This is referred to as “smoking”; the temperature is around 150 – 180 degrees. 30 minutes of smoking is not enough to have any cooking effect on your meat but it is enough to open the pores up so that the meat can pick up all the flavor of the smoke. After 45 minutes, turn the digital control up to 350 degrees and pull the meat off the grill. When the grill comes up to temp, add the meat for 15 minutes, or until the meat reaches an internal temp around 130. Pull the meat off, cover it and let it rest for 10 minutes before serving. This will be rare to medium rare. Keep in mind that the meat will continue cooking for another 10 degrees after you pull it off the grill. So for medium pull it at 140 and overdone 160. I use a Maverick ProTemp Instant Read Thermometer for checking meat temperatures. 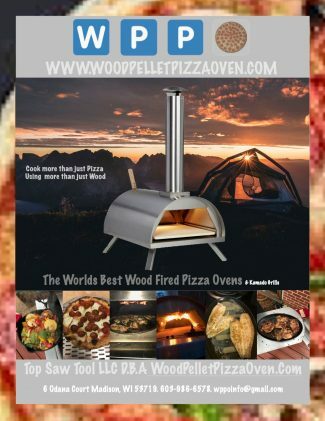 We have been getting requests for recipe conversions for the Pacific Living Pizza Oven. I tell folks all the time that cooking on a Wood Pellet Grill/Smoker is just as easy as cooking in your oven. Just about anyone can do it and do it well. Think about it. You set your control knob to the temp you want, put your meat in and leave it for a set time. It is the same thing, time and temperature is what it is all about. The Royall Wood Pellet Grill is just like your oven except it uses wood pellets and has wheels. How good does a Dove’s Chocolate anything sound? Our friends Nate and Le Tonia are Dove Chocolatiers. A few months ago they sent us some of Dove’s Sweet’N’Spicy Cocoa Rub. I have used it on pork, lamb, duck, chicken and now a beef tri tip. It is not like anything you are thinking. It’s better. For example, the Mexicans have been cooking with chocolate in their foods for 200 years. Most folks don’t realize that a lot of good chili has a little cocoa in it. The cocoa is not meant to be over powering, but just to add another subtle layer to what you are cooking. And that is exactly what has happened here tonight.